Sunday July 25 1911 I was born 60 years ago today in the little bed-room that stood where Mother lies on her sick bed. I came home at 6.10. I felt badly and went to bed awhile I was busy with some cooking all forenoon. We had a fine rain. Down home to stay all night. 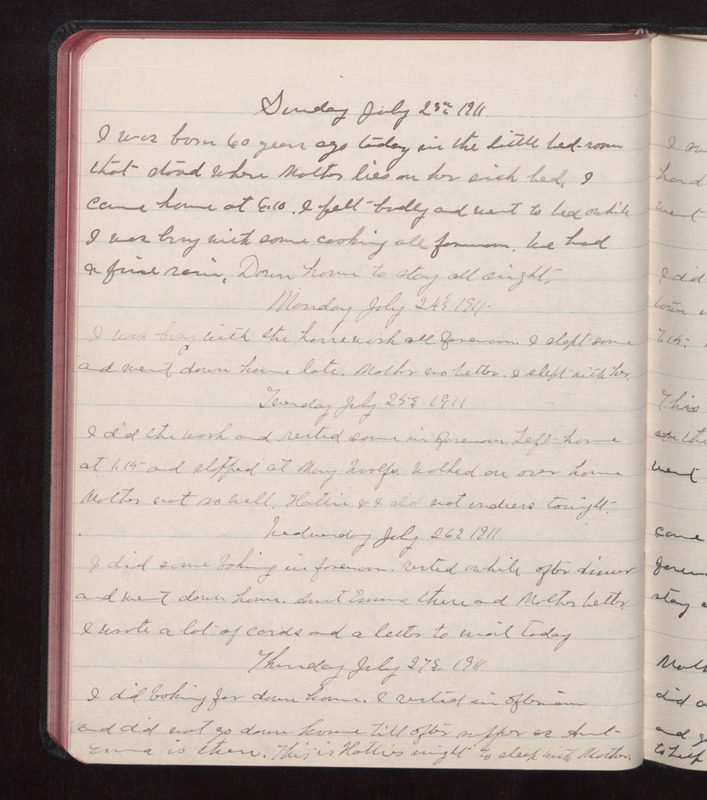 Monday July 24 1911 I was busy with the housework all forenoon. I slept some and went down home late. Mother no better. I slept with her. Tuesday July 25 1911 I did the work and rested some in forenoon. Left home at 1.15 and stopped at Mary Woolfs. Walked on our home Mother not so well. Hattie & I did not [undress?] tonight. Wednesday July 26 1911 I did some baking in forenoon. Rested awhile after dinner and went down home. Aunt Emma there and Mother better. I wrote a lot of cards and a letter to mail today Thursday July 27 1911 I did baking for down home. I visited in afternoon and did not go down home till after supper as Aunt Emma is there. This is Hattie's night to sleep with Mother.